It was currently the coldest time of winter on Nutella. The sun peeked out in an almost apologetic manner from behind the Bagel as it rose sluggishly across the sky. Meanwhile, the land, though filled with enough light for humans to move and work, looked like the kind of monochrome world seen through sunglasses. Once noon approached, the sun would finally come out fully from behind the Bagel. As a result of this unique phenomenon, it was as if there were two sunrises and two sunsets every day. In truth, the sun peeked out often through several cracks between the debris that formed the orbital ring while it was hidden behind the Bagel, so there was always enough light to move by as long as it was daytime. From atop the lookout tower at Subaru’s castle, Homura and the others gazed at the far-off horizon. The edge of the Bagel stretched across the sky and formed a boundary line between light and shadow, slowly moving from north to south as a reflection of Nutella’s planetary rotation. Its shadow, which formed a near-perfect straight line, fell over the ridge line of the snow-capped mountains and slid across the mountain range in wavy patterns, resembling a soundwave graph. The sight resembled the shadows cast by clouds on Earth, but sometimes dispersed beams of light would peek through the cluster of small satellites that formed the orbital ring, illuminating the snowy landscape in strange gradations of pale colors, a unique Nutellan phenomenon that was wholly unlike any rainbows or sun dogs on Earth. They had returned to Subaru’s castle for the first time in three weeks. In Nutellan time, about four months had passed since their last visit. The investigators arrived on the promised day that Kamikoma had declared beforehand, so there was little surprise on Subaru’s face as she greeted the Hiyoshizaka and Seiran club members with an expectant smile. An expedition to far-off and untrodden lands towards the sea coast. This journey on foot across the winter mountain ranges was expected to take four weeks. With the exception of the time they clashed with Subaru-hime, this was their most dangerous mission yet. As such, they didn’t immediately depart after arriving on Nutella and instead made careful preparations first. They performed their preparations at the new base camp instead of Subaru’s castle. However, the investigators were dumbfounded upon seeing the base camp that Subaru had generously offered to continue working on in their absence. Even taking into account that they’d managed to make a lot of progress during their last visit, the camp had still just been an old dilapidated building—and yet now, it looked practically like a high-class boardinghouse. The structure now consisted of a log house that had been seamlessly erected on the stone foundations. The building contained open and bright rooms, an immaculate and user-friendly kitchen and a storeroom that could be used as the base’s transport room. Many of the walls also had glass windows, which had apparently been taken from empty rooms up in the castle. Though currently covered in snow, there was even a terrace on the second floor with a round bathtub that resembled a jacuzzi. The only similar building they knew of was Tomakomai Denpa High’s well-used base camp, but even that couldn’t compare to this one. The young investigators looked up at the new building in stupefaction. Subaru spoke up from behind them. “I was trying to make amends for Suzuran’s fire stunt… but perhaps I went too far…” she said anxiously. There were even complete sets of futon beds stuffed with waterfowl feathers in the bedrooms on the second floor. On the other hand, Kamikoma merely gulped at the sight, speechless. “Is it really that shocking?” asked Homura. …Still, even Homura was able to tell how incredible this place was based on the unabashed joy of her fellow Seiran High members and the jealous gazes from the Hiyoshizaka High members, so she stepped back in an apologetic manner. Since Momoyama-senpai had designed this base camp and even given up her chance to come for the sake of the Seiran High members, they decided to name the building ‘Peach Mountain Manor’ in her honor1. It was a perfect name since there was even an orchard next to the building. The group spread out all their tools for the expedition inside one of the still furniture-less rooms. The parties from both schools went to work organizing them once more and performing a final check. They had brought quite a wide range of Nutella-use tools and ordinary mountain-climbing tools for this expedition. Homura had little to no interest nor knowledge about them, but this last check made her truly realize the purpose of these tools and what kind of environment they were meant to help her in. The special training in Alaska had also been for the sake of familiarizing them with these unfamiliar mountain-climbing tools as much as possible. Though there were apparently rare exceptions to this like Nanakubo Koeda. —To start with, Homura placed her sleeping bag, made specifically for use in winter mountains, on the floor to use as a mat for her tools. The first item she placed on top of it was a huge parka jacket. This parka served as an outer layer over the middle layer of her exploration uniform, which was already made for high-performance in extreme environments. Next was her fleece-like cold-weather gear made of advanced materials, usually worn over her regular clothes during times of rest at the camp or used as an extra layer beneath her parka when it was necessary to move during blizzards. Next, some trekking pants to wear underneath. Boots. Some gaiters to help cover her feet and legs from the snow. Hats. Gloves. Socks. Various spare underwear. …Her clothing alone formed a huge heap. —Then came her snowy mountain-use tools. Snowshoes to equip to her boots. Sole attachments with steel pikes that could similarly be attached to her boots, used depending on the snow cover at the time. Goggles. Trekking poles to be held in either hand. Heat-insulated canteens. A first-aid kit for dealing with injuries and sickness. An emergency kit for emergency withdrawal. Various snack candies to eat on the go. Sunscreen and, of course, the good-luck charm from Narita mountain filled with hundredfold prayers from her mother and little sister. She had even brought the anti-bear tear gas spray that she had used to great effect before. Bears generally hibernated during this time of the year, but there were plenty of other animals that were active during winter. While Homura was checking all her equipment, a wolf—named Kirimaru, according to Saho—came into the base camp and curiously peeked at Homura and her tools, so she held out the spay can as a test, causing the wolf to immediately scamper back out of the building. Homura laughed triumphantly (though her laughter was tinged with tears and desperation), but she then immediately grabbed her head and groaned. “Hey, hey, take proper care of your jacket. We don’t have any more spares here,” said Touya. 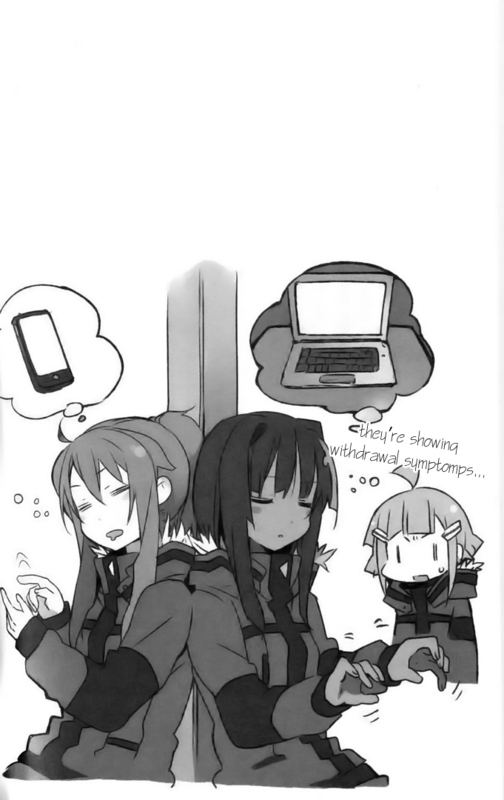 The reason Homura’s voice was weak as she replied was because she was already on her second parka. Just before their departure—Homura had been chatting excitedly with Ameno in the club building and spilled tons of food over her parka where it rested on a chair. Furthermore, she even spilled it over the inner part of the parka, which stained easily and was difficult to clean. She had thus prostrated herself and tearily begged for mercy until they let her run off to exchange it with a spare parka in the club building. Now she really couldn’t laugh at Inari-senpai’s slip-up at the coffee shop. There were just a few personal clothes left for her to sort through now, but still, these were merely the minimum tools for Homura alone to survive amidst the snowy mountains. —And next came the true tools central to conducting this expedition of exploration. These ones were carried by all the club members in allotted shares. The main portion of these essential items consisted of food, cooking implements and fuel for making fires. Their journey would be taking them through lands filled with snow, so they thankfully didn’t have to carry their own water, the most important resource of all, but they needed fuel to heat and melt the snow into water. In addition, there were tents, measuring tools, climbing equipment such as ice pickets and rope for places that were difficult to traverse, and recording equipment such as cameras to document subjects of interest and importance. The Hiyoshizaka High members wouldn’t have been able to carry all this equipment on their own. Increasing the number of expedition members had greatly expanded the extent of their exploration efforts. Glancing behind her, Homura saw that Taga-senpai was carrying a huge piece of baggage that looked as if it held several electric bicycles within it. —Among these important expedition equipment, the portion that Homura had been assigned to carry consisted of items meant as avalanche countermeasures. First was a comparatively lightweight snow shovel. Next was a thin, collapsible three-meter pole called a Sonde. It was a tool used to search for people buried under snow by stabbing it deeply into the snow. During the training in Alaska, they had also used beacons that sent out radio waves to indicate their position to rescuers. However, electronics didn’t work on Nutella, so instead they had all been provided plastic whistles. It released a loud and piercing noise just by blowing into it a little, so it was a useful tool applicable to other emergencies as well. And the greatest special trait of this whistle was that it also released ultrasonic waves at the same time. Human ears couldn’t pick up these ultrasonic waves, but it was within the hearing range of many confirmed TAPC (Trans-Animal Possessed Case) Trans. Among their party’s members, Taga-senpai and Saho were both TAPC Trans, so they would be able to hear the whistles even from under the snow and locate any buried people. It was quite reassuring. —And that summed up all of her equipment. To Homura, this equipment check was a very mentally strenuous task that took half a day. Despite doing the exact same thing, Misasagi managed to finish the check in practically no time at all and then took out a bow to go out hunting in the mountains with Ameno. Ameno had already finished her body’s operation check earlier while on the lightly snow-covered ground from the old base camp to Subaru’s castle. This short mountain hunt apparently doubled as an opportunity to put the finishing touches on that check. Homura recalled the warning Fujimori had given them all before they departed. Having never once imagined she would receive such a warning, Homura was so shocked that she even wondered whether the person in front of her wasn’t Fujimori-sensei at all. However, while Touya was also visibly shaken beside her, he didn’t display any opposition to Fujimori’s words. “…Understood…” said Touya with a quiet nod. That was also quite a shock to Homura. It meant he understood and agreed with the order. Homura was unable to answer immediately, her chest tight. Homura asked to make sure, and Fujimori nodded seriously. After hearing that, Homura was finally able to say yes to Fujimori’s original question as their director. But she still didn’t know… what she would think and feel should that situation actually occur. After turning on the fire in the new base camp’s kitchen for the first time and finishing their first supper there, the female club members went off to borrow the open-air bath at the castle once again. The combination of the sun setting moment by moment beyond the mountains and the twinkling stars in the sky made for a spectacular sight. The Bagel, spanning the western sky with its edges cut off by Nutella’s shadow, formed a far gentler arch than in previous seasons. Bathed in sunlight coming from the other side of the ring, the Bagel shone and filled the night sky with suspicious-looking colors different from those in the summer as well. Just as Homura was returning to the camp from the castle along with the other girls, Subaru called her alone to a stop. Homura tilted her head in puzzlement at being suddenly called out like this, but she still excused herself from Misasagi and the others and went along with Subaru. The destination Subaru led her to wasn’t Subaru’s personal room, but the stables on the castle’s lowest floor. Touya was already waiting there under the lamp light. The stray bed that Ameno used previously was still there like last time. After making the two young ones sit there, the lady of the castle spoke up in a pleasant tone. Subaru’s formal tone made Homura straighten her posture. The waterfall near the castle was almost entirely frozen now. As such, the stables were wrapped in practically painful silence within the castle surrounded by snow. First, Subaru turned to face Touya. Subaru’s words hit upon the very worry that Touya had confessed to Homura at Enoshima. Both Touya and Homura began listening intently now. Subaru bowed her head deeply. Unable to stand the current atmosphere, Homura reflexively spoke up. A chill went down Homura’s spine. That unexpected answer shocked Touya as well, leaving him speechless. Subaru, the very person responsible for this, nodded with an anguished face. After an uncomfortable silence persisted for a while between them, Subaru resumed speaking. “Please tell us,” said Touya in a resolute tone. Subaru looked at Touya with an impressed gaze. “Touya-dono, you can no longer have a new human puppet spell placed on you. You are already my puppet, after all. So even if—though this is a truly frightening prospect—there are casters who can control human puppets among the vagrants, you have no reason to fear falling under their grasp. If such an situation should occur, you should pretend to become their puppet and cut off the ruffian’s head while he or she sleeps,” advised Subaru severely. The way she spoke of ruffians and cutting off heads made Homura feel like she’d slipped into a period drama. Taken aback, Homura sprang up from the bed. Homura was honestly surprised, but her response still sounded carefree somehow, making Subaru raise an eyebrow in bewilderment. After exchanging worried glances with Touya, Homura frantically shook her head. Naturally, Homura was shaken by this talk of her memories being manipulated, but right now she was more worried about Touya. After carefully thinking over what Subaru told them, Touya shook his head. Though he hardly looked relieved, Touya seemed to have come to terms with this matter. Subaru nodded in agreement. Touya nodded again with an annoyed expression that clearly said ‘Quit pestering me over this’. Within the pouch were yellow diamond-shaped stones. Homura and Touya were shocked upon recognizing it. Touya swiftly covered Homura’s mouth. That was a close one. This was the stone possessing terrifying destructive power that Suzuran had thrown at Touya and used in a trap that injured Misasagi during her surprise attack on their old base camp. Touya was filled with surprise and wonder. It was quite a useful item. Touya tried to hand back the pouch. But Subaru had no intention of taking it back, saying he could use it or throw it away as he pleased. Touya wore a conflicted expression. Homura timidly picked up one of the yellow stones from Touya’s hand and asked a question. Homura tilted her head in puzzlement. Upon hearing Touya’s sharp insight, Homura clapped her hands in realization. A catalyst pattern—Chief Toneri had spoken of it, saying, “It’s a special spell pattern that creates a kind of cycle and accelerates or slows a reaction of some kind.” It was a form of persisting magic that the mages among Nutellan investigators were always searching for. Subaru had already managed to grasp the concept. True, the spell system she used had clearly different origins from theirs, but there seemed to be interchangeable concepts shared between them. Just as the investigators were making hypotheses about Nutella’s history based on the hidden meanings behind Subaru’s conduct and words, Subaru had also absorbed Earth knowledge from what the club presidents and Nanakubo had purposefully avoided saying. Subaru turned proud and affectionate as she spoke further. Subaru’s blue eyes glittered under the lamplight as she stared at them. Both Homura and Touya gulped upon hearing Subaru’s invitation to receive instruction. Subaru wore a smile that expressed the sincerity of her words. She winked at them and spoke further. “—Yes!” Homura vigorously replied with all the energy she could muster. Touya covered his scowling face with a hand, exasperated. …No, she was like this right from the start. Recalling that day after school when he called out to Homura and invited her to join the Exploration Club as a mage, Touya couldn’t help but smile wryly. (1) The kanji for Momoyama’s name literally translate to “Peach Mountain”. So many hints, hmmm… Bronze golems… Thugs… HomuHomu not susceptible to mind-interference magics… I wanna cry from all the questions w/o answers! Yay. Thanks for the update. Is it possible that someone made the human puppet spell on Homura(! I’m suspecting that person… Do you remember that time in Homura’s first exploration, I guess. When she went out the tent on the middle of the night and she saw someone. She was really scared at the time!! I’m excited to read the next chapters! OMG!! Thank you so much for the chapter translation!! Vol 2-2 Chapter 22 Complete! Vol 2-2 Chapter 21 Complete! Vol 2-2 Chapter 20 Complete! Vol 2-2 Chapter 19 Complete! Vol 2-2 Chapter 18 Complete!